From the very beginning, National Volunteer Programme has laid down concrete principles of focusing on the right cause to volunteer for. This preamble has held NVP on the right track of striving for signiﬁcant impact through volunteerism. 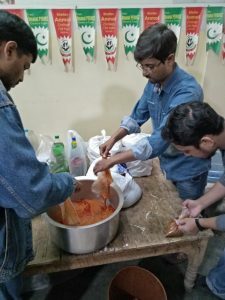 Every volunteer activity is undertaken in the account of genuine social cause and a batch of dedicated volunteers is delegated to lend their time & knowledge and bring about a productive output. Zindagi Trust – SMB Fatima Jinnah Govt. Girls Campus has liaised with NVP since 2.5 years. The premier adheres to a mission of educating nation’s women and aims to leave no compromise over quality education. 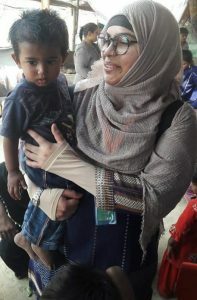 To sustain this, NVP helps with the provision of visionary volunteers like Sheliza Ismail and Iqra Tariq. 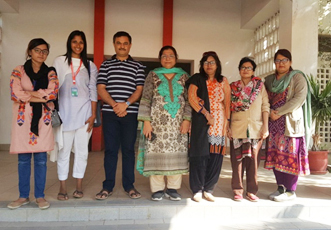 Sheliza has travelled all the way from Canada on a project basis at Aga Khan University Hospital, Karachi. She approached NVP to seek a social service opportunity where she could best serve her capabilities. Whereas Iqra, who has been a beneﬁciary of SMB Fatima Jinnah, has earned her matriculation degree from there and received a chance to give back to her own childhood campus. They have worked in collaboration and pulled out various sessions over career development, English literacy and Arts. 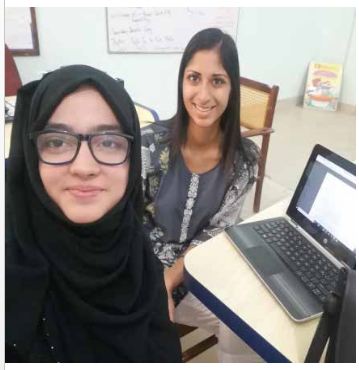 Sheliza Ismail and Iqra Tariq have been working jointly at SMB Fatimah Jinnah School. They planned a curriculum of English language Training together for primary classes so that students can get beneﬁt of both of them. SMB team was of the view that NVP volunteers while imparting incredible knowledge, also worked as mentors for the students. This comes when they share their personal experience. 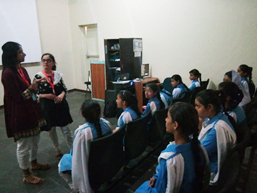 Imagine if you could get a chance to express your own experience for the beneﬁt of students from an under privileged community, it gives you a sense of completeness. The incredible journey of Sheliza and Iqra goes on. 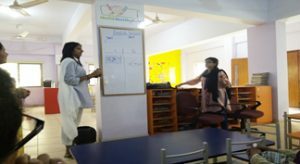 Sheliza used to develop presentations and training components for primary school students as well as nursery teachers, while Iqra used to support her in compiling information and coordinating during training. What makes your ties stronger with NVP? 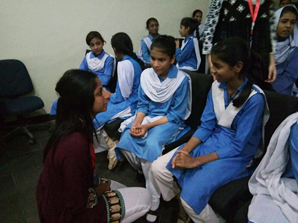 Iqra Tariq: I completed my Matric and Intermediate from SMB and when oﬀered to work with SMB, it was an amazing feeling. You can imagine how you feel getting a chance to return to your childhood school. The wall of every corner at SMB makes me feel proud to give back today. 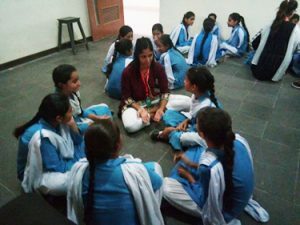 Sheliza Ismail: I am a resident of Canada and stayed in Pakistan to do a project. I had a passion to help the community with counseling and training. Working with SMB School as a trainer was a meaningful experience. 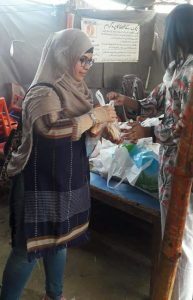 With the passage of time, Sheliza has integrated herself so deeply with SMB that even after completing her volunteer term she showed desire to pursue voluntary service once back from Kenya, Africa. Iqra & Sheliza together with Montessori teachers while demonstrating on a topic. Sheliza taking a training session of Montessori teachers. 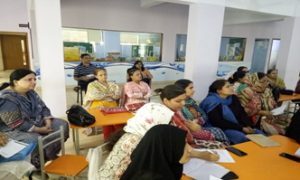 The training designed by Sheliza contained a lot about enhancing learning school of pre-primary students. With great pleasure, we present to you all the 32nd Issue of NVP Newsletter! As always, your comments, suggestions, and contributions are most welcome. Looking forward to hearing back from you all! 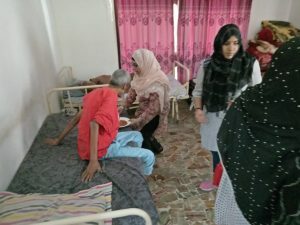 Glow of voluntary services before she departs for higher studies in U.S.
Wasta Fatimah is one of our outshined volunteers who worked on two assignments simultaneously. She worked at Street To School (STS) and Robin Hood Army (RHA). 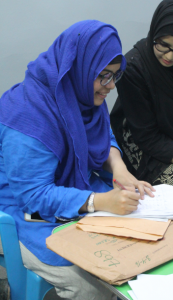 Earlier, Wasta completed her A level studies from PAF chapter in 2016-17 to apply for higher studies in engineering at the United States. She felt her career was critically important to contribute to her society and looked for an opportunity that suited her interest and availability. Wasta joined our team in November last year and decided to contribute most of her available time for NVP campaign. She has been very passionate about community service. EDUCATION & LITERACY – This supported her keen interest to working with children. COMMUNITY DEVELOPMENT – This supported her desire to give back to society in the convenient way that NVP offers. 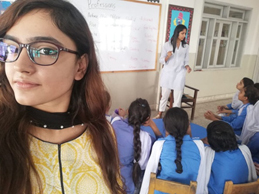 On her departure in January to Dallas, U.S.A. to study mechanical engineering at the University of Texas, she talked about her volunteering experience and how it helped her build a strong network of friends from various institutions. Want to know about how a corporate professional can balance between time allocated for work and time for other aspects of life? 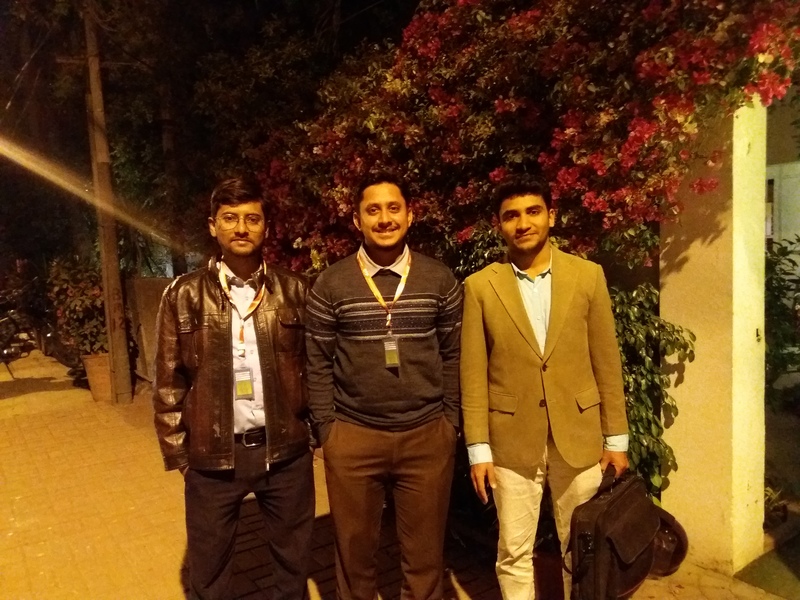 Meet Wajahat and Bilal, NVP volunteers who created a great example of Work-Life balance for all job-oriented persons. 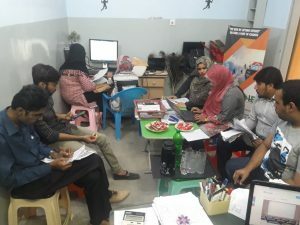 Bilal and Wajahat are corporate professionals and due to official commitment they could not afford to come on Saturdays to attend orientation session. As Petroleum Engineers, Bilal works at ENI as a Project Trainee while Mohammad Wajahat works at InterMark as Sales Engineer. Looking at their commitment level we discussed different options to ensure they could get a chance to sign off forms and submit credentials, as the process is essential for any individual who wants to work as a volunteer. 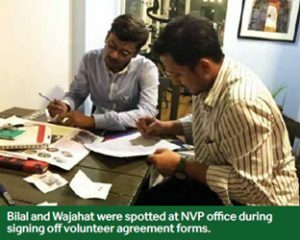 Both friends drove to NVP office after workhours one evening, and sought a discussion with NVP team to reach a volunteer opportunity of their choice. We signed them up for Robin Hood Army campaign and currently they are serving graciously! With great pleasure, we present to you all the 31st Issue of NVP Newsletter! Students are future assets of our society. They do not only perform on academic grounds but are also outstanding performers in social services. Follow the link to read the report on Summer Internship Programme 2018. Do these kids have right to access quality education? Going through Gharibabad Streets, you may discover kids wandering around in the streets. These kids stay denied of the fundamental necessities of life, for example, medicinal services and education. Absence of these necessities makes them vulnerable to the challenges of life coming ahead and this predicts their future miserable. Street to School-STS is a pioneer program of Open for Everyone (O4E) Welfare Organization. Besides focusing on pre schooling curriculum, STS also indulge these children in sports and recreational activities to promote greater health awareness. In such harsh conditions, the young leader ‘Mr. 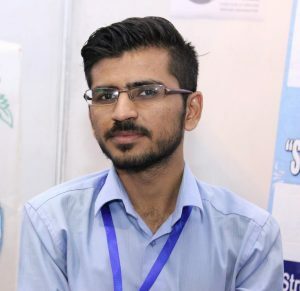 Hassan Ghoghari’ has devoted himself on a mission to bring these kids from street to school. According to Mr. Ghoghari, these kids are full of potential. There has been an in-depth research and crucial ground work carried out by STS team before commencing school in this area. 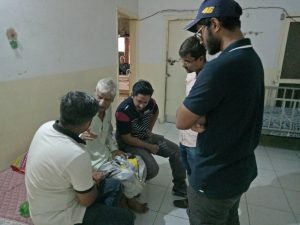 They went out to spread importance and awareness of education within community; Not only to parents but to small vendors and shopkeepers where these children were hired on a daily wages. In start, STS team convinced parents to send children for just 3 hours in the morning. And now after 4 years it has become a school of 150 children, a mid-size school in a small community of Liaquatabad. When Street To School got a chance to engage NVP Volunteers as Exam Invigilator to ensure transparency and improve conduct of exam. NVP reached out to the community at Gharibabad on the request of Street To School (STS), to discuss mutual collaboration during exams. STS used to conduct exams upon completion of syllabus but this time they were in search to have their exams in more transparent manner. 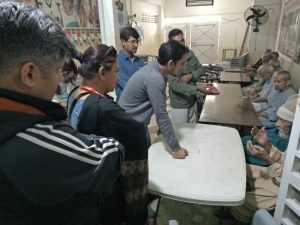 We found it useful to connect through Volunteers so as to ascertain an independent result. 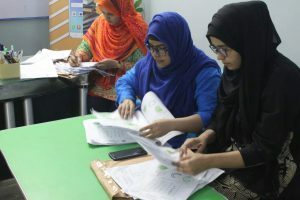 Volunteers were assigned to serve as Exam Invigilators. It was not that they were merely the invigilators during exams but there were many other things offered by them. The initial phase of the project was to invigilate exams in an unbiased manner. Volunteers were assigned to monitor the conduct of papers. Students were encouraged to give their best. Term exam were scheduled for one-week during 11-16 November consecutively and Volunteers along with STS team executed it smoothly. Such strict decorum puts a barrier on cheating culture that is prevailing in our education system. The day and night struggle of students, teachers and parents ought to be fairly evaluated to pay off their hard work. Assigned Volunteers checked, rechecked and verified the marking criteria to eliminate the chances of any error in this assignment, bearing sensitivity. The assignment finally concluded with feed backs and suggestions as quoted by volunteers based on their keen observation. Street to School management had applauded efforts put in by each individual Volunteer in taking this project on height of success. Please click below link to view more pictures of activity. With great pleasure, we present to you all the 30th Issue of NVP Newsletter! With great pleasure, we present to you all the 29th Issue of NVP Newsletter! With great pleasure, we present to you all the 28th Issue of NVP Newsletter!